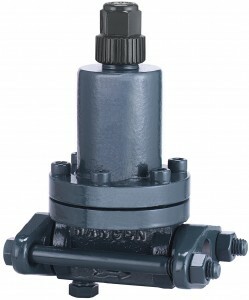 These regulators are commonly-used in small capacity applications or as a pilot valve to operate larger main valve and a non-atmospheric relief to low side (HA2BK). These regulators are furnished with flanges for FPT (Female Pipe Thread, American National Standard, tapered), socket weld or weld neck (to match American Pipe Schedule 40), or ODS (Outside Diameter Sweat) for copper tubing size connections. They have an inlet pressure gauge port. These regulators can be furnished with close-coupled strainers on the inlet. The HA2BQ and HA2BT are different construction, using the same screw-in control modules (pilots) found on the Hansen HA4AQ and HA4AT pressure regulators.